Student choice is a cornerstone of student engagement. When students can take charge of their learning and can pursue topics of interest, they will be more engaged and more inclined to do the work, and their work will become more meaningful. We’ve all heard this time and again, but the practicality of doing this in today’s secondary public school classroom can be quite a challenge because of standardized testing. Depending on where you teach and how you’re evaluated for your teaching position, testing may be the most important evaluative component, or not matter much at all. Having taught in Dallas, Chicago, and New York City, I find that the lower a city’s student performance and graduation rate, the more those students are tested and the more those tests count towards teacher performance evaluations. However, standardized testing does not mean that you have to teach to the test all the time. I was still able to work in student choice. How is this possible given the constraints of a high-stakes testing climate? I think student choice doesn’t have to mean students get to “do what they want when they want.” It doesn’t mean that it has to be open-ended. It’s important to find ways to work in student choice within the framework of skills in your given content area… in our case English Language Arts. There are many ways to work in student choice every day in your classroom. Here is a list of 15 ways to integrate choice into your secondary English Language Arts curriculum. As mentioned previously, essay writing is an accessible way for teachers to build in student choice. This can be accomplished by allowing students to choose their own prompt or topic of research. One of the methods I like to use in my high school ELA classes is the Topic-Theme List. Instead of assigning students to a specific theme to analyze in an essay, have them keep Topic-Theme Lists for every major text so that when it's time to write, they can select a theme of their choice to analyze in an essay. I have my students keep this list in their Writer's Notebooks throughout the school year. Here is a sample topic-theme list for Dr. Jekyll and Mr. Hyde along with the assignment. When students can spend time on a topic of interest, they will be more engaged throughout the writing process. After all, we aren’t grading the topic; we’re grading the writing. The concept of "Genius Hour" comes from Google. Google employees are given 20% of their time to work on pet passion projects. This time is meant to encourage their innovation outside the requirements of their specific jobs. Employees then share or present their projects as they make new discoveries. Some of these even lead to new, innovative technologies. We can apply this same concept in our classes, and there are various ways to do so. Teachers can implement "Genius Hour" across a week or even across an entire semester. There are ways to scaffold Genius Hour as well. An easy and accessible way to implement the "Genius Hour" concept in your classes is to have students explore a topic of their choice over the week and present their findings to the class on Fridays. You can easily connect these mini passion projects to writing workshop and have students write about their discoveries along with targeted writing workshop mini-lessons. The options are endless! If you’d like a more structured approach to Genius Hour, check out the 20% Time Project here. The 20% Time Project comes with guidelines, templates, and an online community for implementation that will help you structure this concept in your classroom. "I wonder why a rainbow sometimes forms when it rains." "I wonder what it takes to become a cardiologist." "I wonder what made Nelson Mandela famous." "I wonder how setting affects the theme of a story." As you can see, "I Wonder" Statements are completely open-ended, and students can explore a wide range of topics based upon their own interests and gaps in their own knowledge. 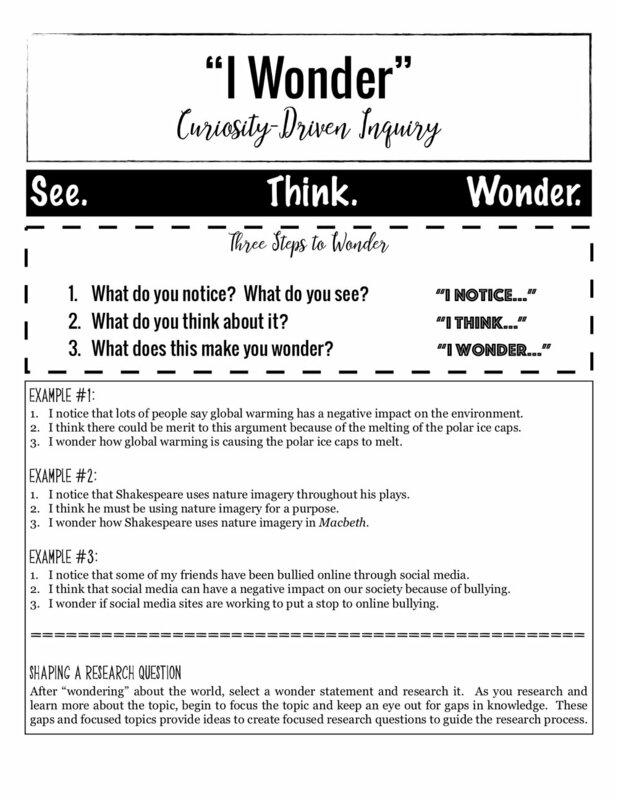 Check out the "I Wonder" Statements freebie included in the Bespoke ELA FREEBIES section to implement this strategy with your students! Book Clubs are an excellent tool that allow students to choose their own text to read, analyze, discuss, and study in groups. You may limit students to a specific list of titles, or make it a free-choice book study. It all depends on what works for you, your students, and your curriculum. I have created a few Book Club freebies to get your students started! Follow these links to check them out! The Capstone Project concept comes from the university level in which undergraduate and graduate students at certain universities must pursue a topic of interest within their major and then present their research as a requirement for graduation. The CAPSTONE is supposed to be a summative assessment of the student's focus of study and synthesizes the various skills and knowledge acquired throughout academic study. This is the concept that has informed the new(ish) concept of AP CAPSTONE that includes Seminar and Research classes. ...and many more! After students present their projects to the class, they all complete the same reflection writing activity to explain their projects in writing and discussion. Think of a CAPSTONE Project in terms of a summative project much like a "thesis." These projects can be a great way to let students explore their own ideas! This option stems off the previous options. A CAPSTONE Project could easily be a blog or portfolio of work. A Genius Hour project could also involve this means of presenting findings and synthesizing information. Blogs and portfolios allow students ample opportunity for choice. Students can choose what goes into their blog or portfolio, how it's organized, how it's laid out, what it looks like, what it's called, etc. Basically, students can create their own bespoke portfolio of work to showcase their learning and growth. These can be scaffolded as needed, or you could simply tell students, "Don't stop until you're proud," and let them decide when it's finished and ready for publication. Along with academic writing and academic projects, students need time to explore creative pursuits. I can't remember a time as a high school English teacher that a student chose to write a literary analysis essay during free write time (see next item on this list). 99.9% of students freely choose creative writing over any other mode of writing. Why is this the case? Creative writing is not confined by the same limitations as academic writing. Through creative writing, students have the chance to be free and to explore their emotions and life experiences. Academic writing is more sterile and impersonal. It takes the "I" out of writing. At its core, writing is a very powerful tool to help us make sense out of our lives and to process life experiences, which is why students (and humans) gravitate towards it. Creative writing provides a much needed outlet for students, and it also enriches the student's experience with life and with the class as a whole. But just because it's creative writing doesn't mean that it's not also analytical writing. Creating something from nothing is much more difficult than analyzing something that already exists. That's the reason why we aren't all famous screenplay writers or songwriters or authors. These are difficult pursuits because they require us to synthesize our skills and think beyond ourselves. Giving students some time explore their creative sides is important. One of the projects I give my students is a Screenplay Project. This project gives students the task of creating their own film concept all the while assessing key literary elements and techniques. You can find more information about this project here. Stemming off of the previous choice topic of creative writing is to allow students FREE WRITE TIME. This is time built into the schedule wherein students are free to write what they want. It could be a list; it could be a poem; it could be a personal narrative; it could be a character sketch, etc. This is the student's time to write what the student wants to write. Much like a passion writing project, students can explore their interests and curiosities through writing. There are many ways to implement free write time into your curriculum schedule. Consider giving students 20% time as free writing like Genius Hour time. You can even have students turn in a writing project of their choice for a grade, publish it on the classroom blog, or just share it informally in small groups. There are LOTS of options with these options. In the past, I've had my students keep a "FREE WRITE" section in their Writer’s Notebooks where they could explore their writing interests. It is more important for your students' voices to fill the classroom than yours as the teacher, and one of the ways to facilitate this is by training students to lead their own discussions. I like to use a discussion rubric with my students (included below) that gives students instructions on how they will be scored during a class discussion. I like to require my students to speak 2-3 times during discussion and connect their statements to textual evidence for full credit. If a student does not speak during the discussion, he/she may turn in their written responses for credit. I also like to provide opportunities for students to earn bonus points during a graded discussion that include such things as bringing another student into the discussion, playing devil's advocate, and bringing the conversation back to the question or topic. I keep track of these points throughout the discussion. Once students have been trained on how the discussion format works, I assign a student to be the moderator, and they hold the discussion without much intervention from me. There are many ways to implement class discussions including Fish Bowl style, small group discussion, or even hot seat questions. But no matter which strategy you choose, allowing students to take the lead is key. 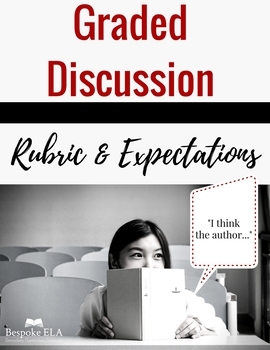 Click here to view the Bespoke ELA Discussion Guide, Rubric, and Stems to get started with an easy format for implementing graded discussions into your secondary ELA classes. Seating is another way to allow for student choice in the classroom. Just follow this simple principle: Allow students to choose where they sit! Research shows that when students are allowed to choose where they sit, they tend to sit where they are most comfortable for learning, which includes placement in the room and near the people that will help them learn best—ok, their FRIENDS! The challenge, of course, with flexible seating or free-choice seating is that students may talk and be off-task. But I’ve generally found with high school students that establishing rules at the beginning of the school year works, and if it doesn't, simply move the student. You could even have students sign a class contract at the beginning of the school year about seating expectations. Flexible seating arrangements can allow for students to be more comfortable during a time in their life (grades 6-12) when insecurity is at an all-time HIGH! You can even bring in optional seating such as sofas and bean bag chairs, but this entirely depends on your school and district. I wasn’t allowed to even dim the lights and use a lamp or have my own BOOK CASE where I taught in New York City (fire hazard—too many students in such a small space), let alone a sofa… but I could move the desks around in clusters or various discussion formats and allow students to choose where they sat. Teachers are creatures of invention. Work with what you have! Choice HOMEWORK? Yes! For ELA, this could include allowing students to choose which passage to analyze, or which article to bring in for close reading... or it could include allowing students to select which five homework assignments across the marking period to turn in for a grade. Another more open-ended homework assignment is to let students work on an assignment until “they’re proud.” Let them be the ones to decide what work needs to be done at home. One of my favorite homework assignments to give students after writing workshop is “Revise/edit as needed.” Student should have an idea of what they need to work on, so giving them the power to make those decisions can be powerful. If a student falls behind because of this freedom, you can always intervene with that specific student and give more structured assignments. But overall, integrating choice into homework can engage students. This is a popular method among educators today. The way it works is that choices are placed on the board. The students (or the teacher) basically create a menu of options for the class period, and students get to choose which tasks they complete. You can require students complete a specific number of tasks, or even do three in a row to make tic-tac-toe (in the case that you’ve displayed the options in a grid format). I like to use this strategy for a writing workshop day after students have completed a set of mini-lessons. I start by asking students, “What are some things we can do to edit/ revise our essays today?” Students then generate a list. I write it on the board, or type it up on the screen. And then, I turn them loose by requiring them to complete 2-3 tasks during class. At the end of the class period, I have them get out a piece of paper and tell me which tasks they completed for a class participation grade-- or have them turn in their work. This is also a great option to give some structure to “project workdays” in class. Celebrating student achievement is another excellent way to integrate choice. Let students select the work they want to showcase… and then put it on display! There are many ways to do this from class bulletin boards to class anthologies to museum walks to student portfolios. I like to have my students compile a class anthology in which they select one piece of writing (the piece of which they are most proud), and they "publish" it in the anthology. Over the years, I have collected many class anthologies and students get to go back and read through them during free reading time. It gives their work purpose by creating a legacy and also encourages them to be proud of their hard work. This project is almost entirely student-driven. They select their publishing "jobs," name the anthology, organize it, collect work, compile it, and publish it-- all without much intervention from me. It's so hard to see them try things that I know won't work, but that's part of the learning process. As teachers, we have to let our students fail and allow them the chance to problem-solve on their own. It's amazing what they can do when we take a step back! Yes, it’s possible!! Allow students the option of selecting which questions to answer. What??? YES! Here’s what will happen. Students will SKIP the ones they don’t know. So, you can grade the ones they did answer, but then after the test, get them into groups to go over all the questions and discuss all the answers. This way students aren’t penalized for what they didn’t know. They are rewarded for what they DID know and can then work on the other questions to develop their understanding. I also like to offer students options for their short answer or essay questions. There are multiple ways to design prompts to assess the same skills. 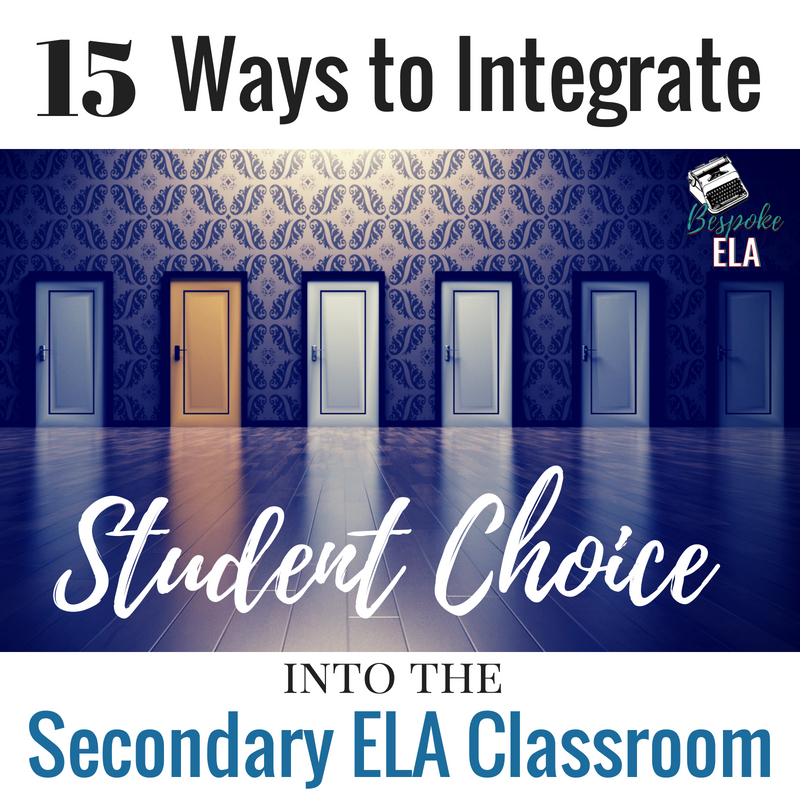 What other ways do you integrate choice into your secondary ELA classes? I'd love to hear from you and add to this list of ideas!